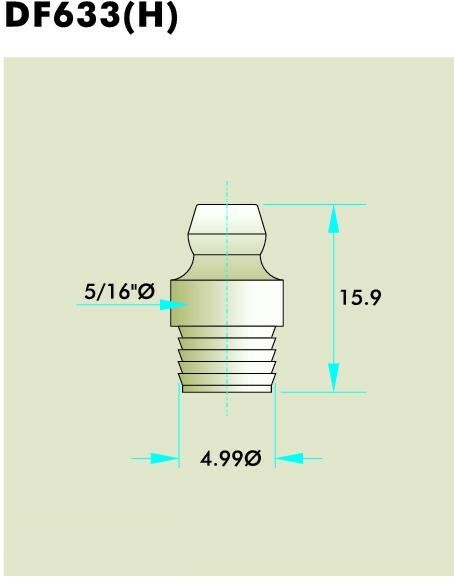 Uniformly case hardened 0.005" - 0.009"
* DF019 (H) Straight 3.39 11.9 4.0 5/16" 1/8"
* DF009 (H) Straight 4.99 9.9 2.4 5/16" 3/16"
DF300 (H) Straight 4.99 10.9 3.4 5/16" 3/16"
* DF005 (H) Straight 4.99 11.9 4.4 5/16" 3/16"
* DF006 (H) Straight 4.99 12.3 5.6 9/13" 3/16"
DF728 (H) Straight 4.99 13.1 6.35 5/16" 3/16"
* DF633 (H) Straight 4.99 15.9 6.35 5/16" 3/16"
DF992 (H) 45° 4.99 21.0 5.6 Hex. 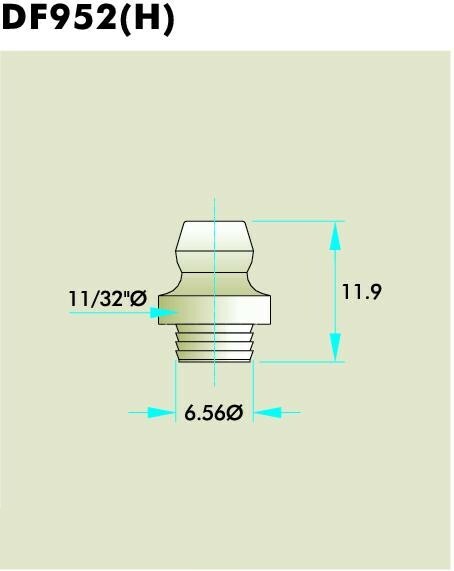 3/8" 3/16"
DF646 (H) 65° 4.99 17.9 5.6 Hex. 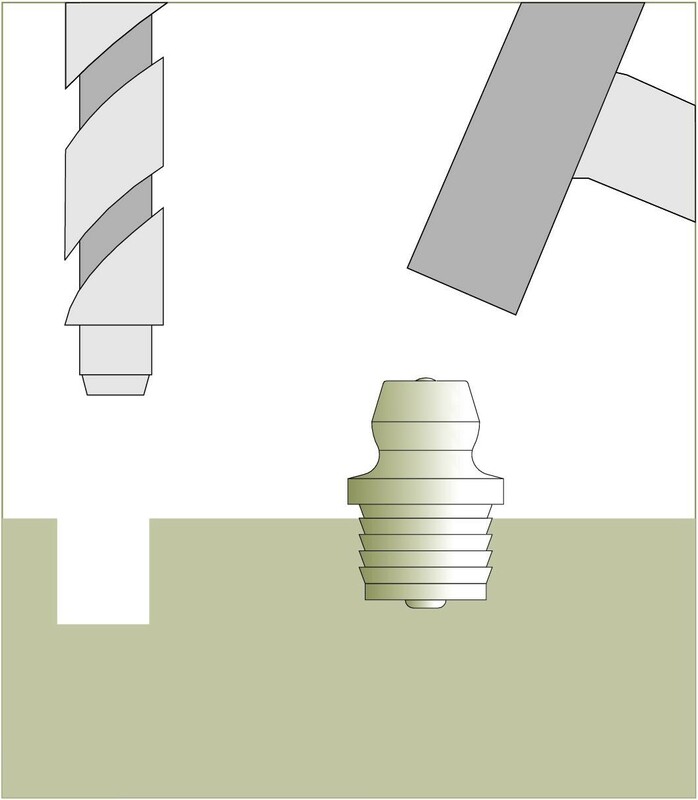 3/16" 3/16"
* DF952 (H) Straight 6.56 11.9 3.2 11/32" 1/4"
DF743 (H) Straight 6.56 13.9 6.35 11/32" 1/4"
DF318 (H) 65° 6.56 19.4 7.14 Hex. 3/8" 1/4"
DF608 (H) Straight 8.16 13.9 6.35 3/8" 5/16"
DF630 (H) 65° 8.16 17.9 5.6 Hex. 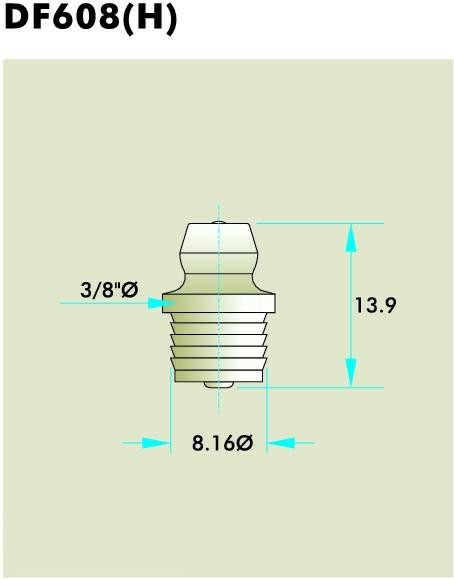 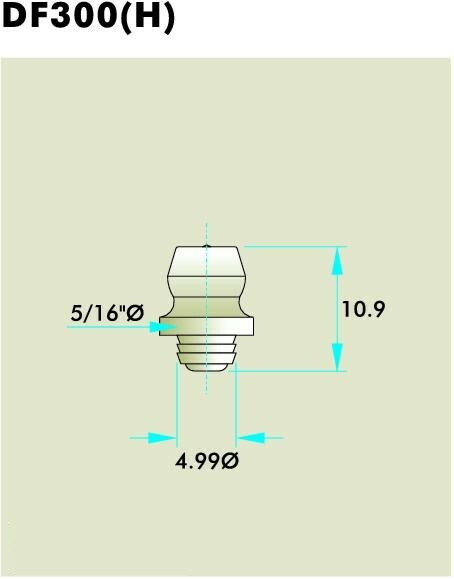 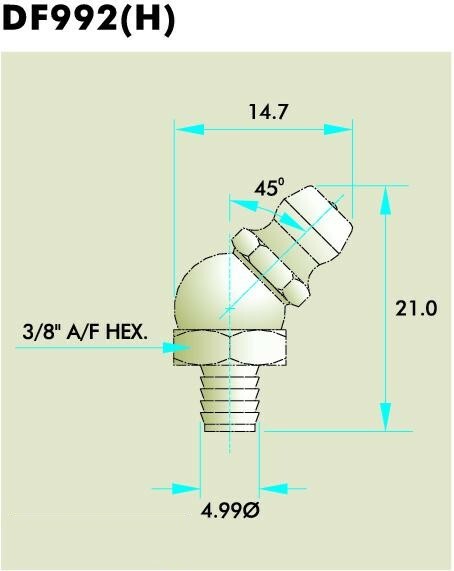 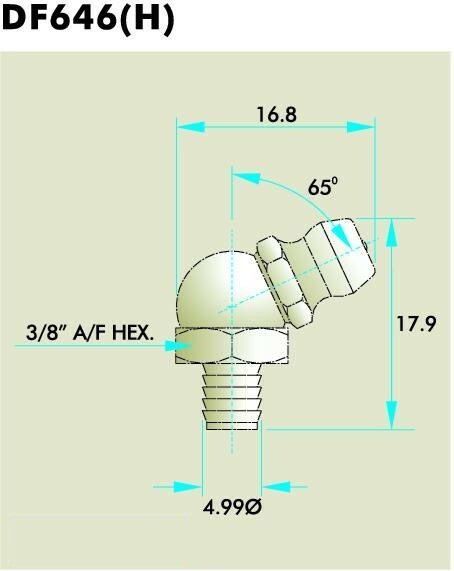 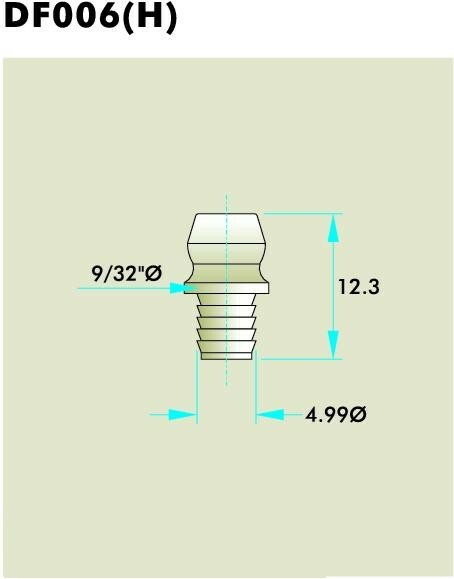 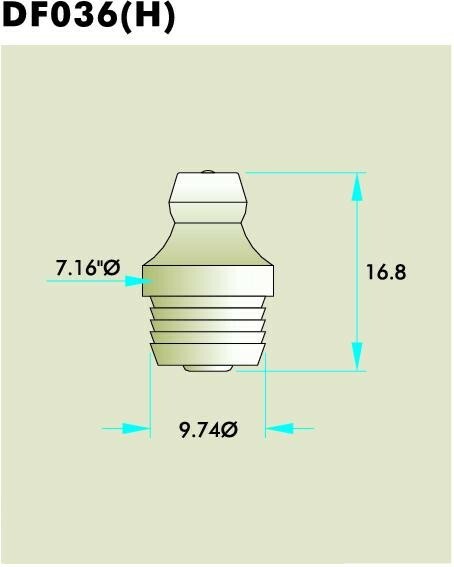 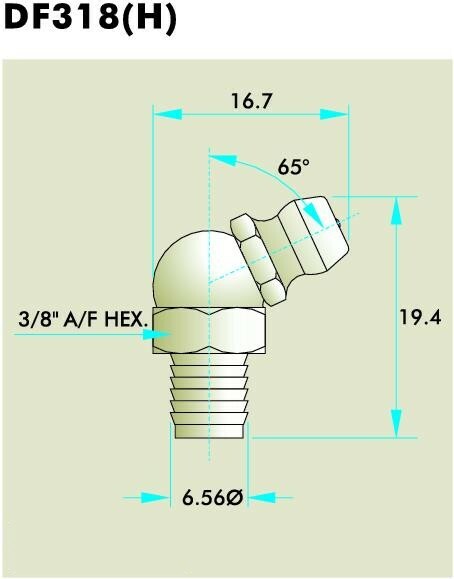 3/8" 5/16"
DF036 (H) Straight 9.74 16.8 6.35 7/16" 3/8"
DF3036 (H) Straight 4.99 9.5 7.9 6.35 mm 3/16"
HDF347 (H) Straight 5.56 12.7 5.33 7.90 mm 1/4"
*DF699 (H) Straight 8.16 15.9 5.6 3/8" 5/16"
WBDF66 (H) Straight 9.74 14.7 5.6 7/16" 3/8"
* Fittings without ball check. 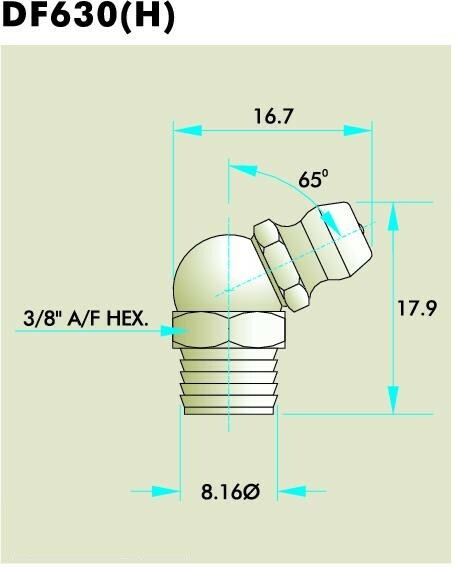 DRILL DIA-1/8" DRILL DIA-3/16" DRILL DIA-3/16" DRILL DIA-3/16"
DRILL DIA-3/16" DRILL DIA-3/16" DRILL DIA-3/16" DRILL DIA-3/16"
DRILL DIA-3/16" DRILL DIA-1/4" DRILL DIA-1/4" DRILL DIA-1/4"